Striker Danny Hylton is keeping his eyes firmly on the prize as Town head into the final eight games of the season. The Hatters are currently five points clear of Barnsley, although that gap could be reduced to two by the time Luton kick off at home to Doncaster Rovers tomorrow, with the Tykes in action at Walsall in the lunchtime kick-off. Although Town couldn’t gain any further advantage lat weekend with both side's drawing, they did see Sunderland in third close the gap to seven points, with a game in hand, by beating Walsall. The Black Cats now face two weeks without a league game due to international call-ups and the Checkatrade Trophy final, but Hylton said: “We’re five points clear, eight games to go, games are running out for teams to catch us, so we’ll keep trying to do what we’re doing and pick up as many points as we can. “We don’t want to pay too much attention to what they’re doing, we’re just trying to take care of our games. After coming up from League Two last season, Hylton reiterated his lack of surprise that the Hatters find themselves in such a lofty position at the summit. He continued: “I know that group and I know the players we’ve got. “League Two was difficult, there were tough games, away games are hard as people make really hard. "You come into League One and a lot of teams try and play football, so I knew it would probably suit us a little bit more. "We’re a footballing team, we work hard, we stick together, we’ve got a great team spirit and that’s tough to play against. "You mix that with the ability we have in there, I knew that we would have a good season. Hylton nabbed the opener against Gillingham last weekend and then saw Jack Stacey make it 201 with his second goal in successive games. On the right back, who has been in stellar form this term, he said: “He’s unbelievable Stace and he just runs all the time, he loves running! “Both our full backs, him and JJ (James Justin) are such good outlets for us, a massive part of the way that we play. 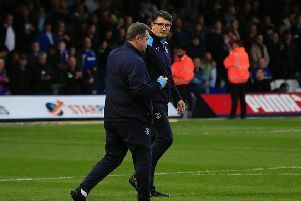 “Stacey gets a lot of stick sometimes from us, because he gets in positions and Collo (James Collins) is a moaner, he moans that he should be looking and Stace should be passing to him. “But he gets in those positions last two games and he’s scored. “His end product is getting better and better and better and he’s doing amazing for us. Meanwhile, when asked about the midfielder Andrew Shinnie, who gave yet another starring performance, Hylton added: “He’s Shinniesta, he’s living up to his name isn’t he? “He’s a massive part of the way we play. "He gets on it, always wants the ball, you can give it to him anywhere and he’s fantastic.